The search of a continuous image with a minimum display of materials has brought to the design of many buildings wrapped in lattices, as this laboratory building in Shanghai. The curious thing is that the ceramic lattice is formed by a simple repertoire of pieces that are stacked on site. 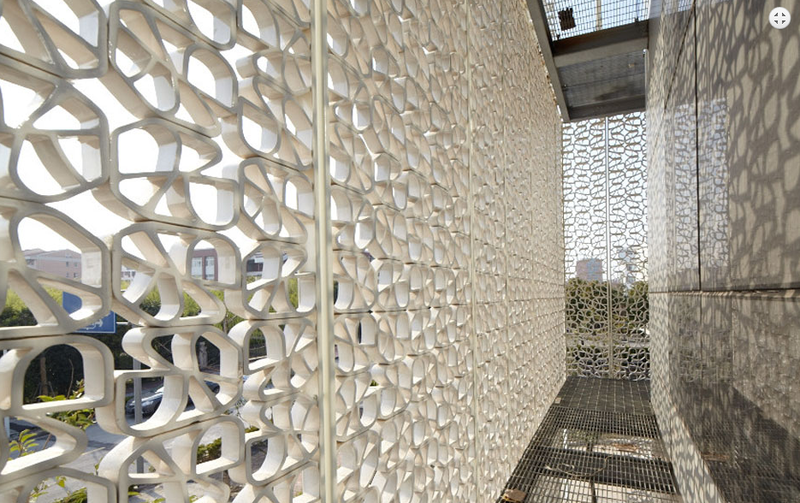 The ceramic lattice is separated from the facade itself, which has an absolutely independent composition of gaps. Metallic walkways solve maintenance and cleaning problems. The most important aspect is that many of the frames that are filled with the stackable lattices are pivoting, allowing the windows of the inner façade access to direct contact with the outside.